Windows 10 Insider Preview and Final release. Hey Guys, I welcome you to Geeabo.com, And I have created this community for all those friends who want to know about technology. 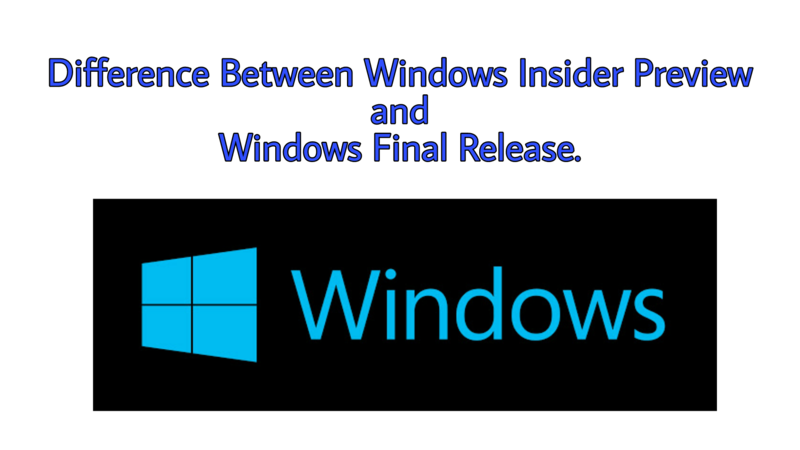 Today I will tell you that What is the Difference between Windows 10 Insider Preview and Windows 10 Final release. Friends here I will tell you in short about Windows 10 and this is for newbie. So, Windows is a GUI (Graphical User Interface) based Operating System For Personal Computers (PCs) from Microsoft Corporation. Windows 10 is the Latest Version of Microsoft’s Operating System. Windows 10 is the flagship Operating System by Microsoft. The latest version of Windows 10 is 1703 Creators Update. Due to considerable criticisms of Windows 8. Microsoft Decides that we will make Windows 10 and remove everything that has drawbacks in Windows 8. And give our customers a better Windows experience. Windows 10 Best Windows Ever. We all know that Windows 10 is a free operating system Software. Now the question is, Is it possible that Windows 10 can be downloaded for free by Microsoft? Now you are thinking that when Windows 10 comes in free, then why would anyone buy Windows 10 with money? So Friends, Windows 10 Insider Preview is very easy to download and install in PC. And you can use it without any limitation. So Friends, now I want to tell you in clear words about the difference between Windows 10 Insider Preview and Windows 10 Final release. And Finally, only difference between the Windows 10 Insider Preview and Windows 10 Final release is that you can sometimes see occasional bugs with few issues in the Windows 10 Insider Preview and not in Windows 10 Final Release. But you can use Windows 10 preview for free without any limitations. ⟵How to Enable VoLTE in 4G or LTE Android Phone?